A sofa is often the focal point of the room. The cushions provide a comfortable place for several people to sit or a place for one person to stretch out and nap. However, there are many things to consider when selecting a sofa, such as the type of cushion you want. Some sofas have square cushions while others have T cushions. Sofas come in a variety of styles. Buying a sofa involves spending a substantial amount of money. In addition, because sofas last a long time you want to get something that you will enjoy living with for an extended time. 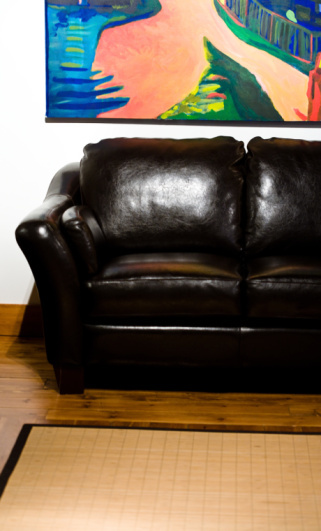 You can keep a sofa even longer by having it reupholstered to replace the worn fabric. Moreover, since the cushions are usually the first thing to wear out, being able to access and repair flat or lumpy cushions is desirable. Paying attention to the details of the sofa is essential. One of those details is the shape of the cushions. Some sofas have square cushions. Square or rectangular cushions have straight sides, unlike the irregular shape of T-cushions. You can flip over and reverse square cushions. These types of cushions are also easier to reupholster or replace the foam inside the cushion because of their straight lines. T-cushions on a sofa often look more formal. A T-cushion has the outlined shape of a "T." The cushion fits on a sofa or chair by extending over the arm. T-cushions can be found on both backs and seats. On a T-cushion seat, the sofa arms are set back from the front edge, and the cushion extends over the front of the arm from the edge of the seat. Think of it as a regular square cushion with a piece added onto it that forms the 'T' shape. 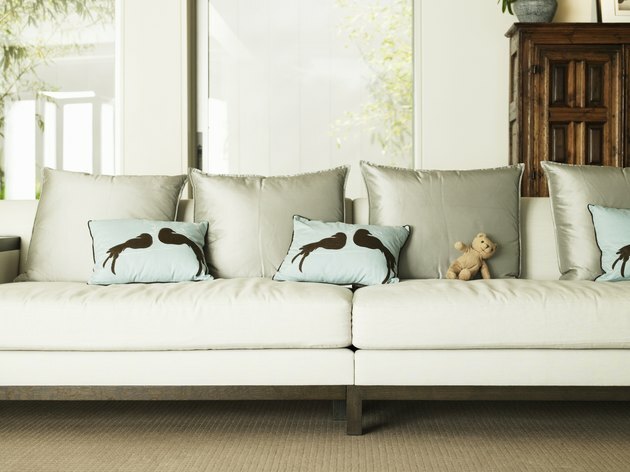 Since sofas have more than one cushion, each of the T-cushions are only half the 'T.' The 'T' part of the cushion is next to each arm, and the cushions have one straight side to fit against the next cushion. People often sit on either end of the sofa, close to arms, instead of in the center, causing uneven wear on cushions. It's easier to prevent uneven wear on square cushions because their even sides allow you to flip them around and put them on different parts of the couch, delaying the need to reupholster them. All you can do is turn the T-cushions over because they only fit next to the arms of the sofa. In addition, the shape of the T-cushion requires more difficult to reupholster. Jeanne Young began writing professionally in 2000. She was the government reporter for a daily newspaper in central Florida. Young has also covered general assignment and the business, health, science, environment and education beats for newspapers and a wire service, and written about money and politics. She holds a Bachelor of Arts in English from the University of South Florida. What Is a T-Cushion Sofa? What Is a Modular Sofa & Loveseat?